24-06-2002 10:00 pm Paris - Africa developed its own iron industry some 5,000 years ago, according to a formidable new scientific work from UNESCO Publishing that challenges a lot of conventional thinking on the subject. Iron technology did not come to Africa from western Asia via Carthage or Merowe as was long thought, concludes "Aux origines de la métallurgie du fer en Afrique, Une ancienneté méconnue: Afrique de l'Ouest et Afrique centrale". The theory that it was imported from somewhere else, which - the book points out - nicely fitted colonial prejudices, does not stand up in the face of new scientific discoveries, including the probable existence of one or more centres of iron-working in west and central Africa andthe Great Lakes area. The authors of this joint work, which is part of the "Iron Roads in Africa" project (see box), are distinguished archaeologists, engineers, historians, anthropologists and sociologists. As they trace the history of iron in Africa, including many technical details and discussion of the social, economic and cultural effects of the industry, they restore to the continent "this important yardstick of civilisation that it has been denied up to now," writes Doudou Diène, former head ofUNESCO's Division of Intercultural Dialogue, who wrote the book's preface. But the facts speak for themselves. Tests on material excavated since the 1980s show that iron was worked at least as long ago as 1500 BC at Termit, in eastern Niger, while iron did not appear in Tunisia or Nubia before the 6th century BC. At Egaro, west of Termit, material has been dated earlier than 2500 BC, which makes African metalworking contemporary with that of the Middle East. The roots of metallurgy in Africa go very deep. However, French archaeologist Gérard Quéchon cautions that "having roots does not mean they are deeper than those of others," that "it is not important whether African metallurgy is the newest or the oldest" and that if new discoveries "show iron came from somewhere else, this would not make Africa less or more virtuous." "In fact, only in Africa do you find such a range of practices in the process of direct reduction [a method in which metal is obtained in a single operation without smelting],and metal workers who were so inventive that they could extract iron in furnaces made out of the trunks of banana trees," says Hamady Bocoum, one of the authors. This ingenuity was praised in the early 19th century by the Tunisian scholar Mohamed el-Tounsy, who told of travelling in Chad and Sudan and coming across spears and daggers made "with the skill of the English" and iron piping with "bends and twists like some European pipes, but more elegant and graceful and shining so brightly they seem to be made of silver." There is a true iron culture in Africa. In many communities, iron is so revered it has been given divine status. In Nigeria's Yoruba country, forges became the symbol of royalty at the end of the 9th century and Ogun, the god of iron, became the protector of the kingdom. Even today, Ogun is the chief deity of anyone working with iron. The role of blacksmiths is very important in African culture. In the Yatenga region of northern Burkina Faso, Bamogo, the ancestor of blacksmiths, is considered the saviour of humanity. It is he who supposedly makes the knife that cuts the umbilical cord, the axe that chops wood, the pick used to till the soil or help dig a grave - all of them instruments of fundamental importance for people. According to Pierre de Maret, who teaches at the Free University of Brussels, the Bantu people spread across central Africa "because of their superiority as farmers, achieved by using metal to clear forest areas, and the military superiority they acquired from having iron weapons." Among the Yoruba, it seems equally clear that the unification of the country by supporters of Oduduwa in the 10th century was very largely due to military dominance gained through the use of iron, says Isaac Adeagbo Akinjogbin, of Obafemi Awolowo University, in Ile-Ife (Nigeria). Under the Oduduwa dynasty, each kingdom had enough foundries and forges to produce all the metal tools it needed. "In 17th and 18th century Africa, at the height of the transatlantic slave trade, the Yoruba continued to use iron they produced themselves, regarding imported iron as religiously impure and 'unresponsive.'" Iron technology became a key part of African spiritual life and these skills have persisted to this day. Just like their ancestors, who had "the habit of gathering bits of metal of different kinds and origins to make into new objects," says Bocoum," today's craftsmen have incorporated traditional know-how in the production of modern tools. Associations of blacksmiths, such as the one in the Medina district of Bamako, are flourishing, and turning out all kinds of everyday metal objects, mainly from scrap. Though it seemed to be disappearing at one stage because it was not commercially competitive, iron craftsmanship is today enjoying a revival in Africa. Launched by UNESCO in 1991 as part of the World Decade for Cultural Development (1988-97), the Iron Roads in Africa project aims to make the continent's technological culture better known, so as to help it better confront the challenges of development. It encourages inter-disciplinary scientific research in working with iron that could influence industrial development strategies of African countries whilst offering a framework for cultural, artistic and educational activity. Along with the Silk Roads, the Roads of Faith and the Slave Route, the Iron Roads project boosts cultural diversity and counters racism by pointing to Africa's contribution to the ideals of tolerance, mutual understanding and dialogue. This same goal is found in the history books published by UNESCO, such as the "History of Humanity" and the "General History of Africa". 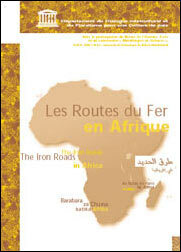 A series of scientific meetings, in Maputo (1991), Abuja (1995), Geneva and Paris (1999), Addis Ababa (2000) and Paris (2001), organized as part of the project, resulted in a brochure called "Les Routes de Fer en Afrique" (Paris, UNESCO 2000) and a book called "Aux origines de la métallurgie du fer en Afrique, Une ancienneté méconnue: Afrique de l'Ouest et Afrique centrale" (UNESCO Publishing 2002). The project includes a multi-disciplinary travelling exhibition, which was shown at UNESCO Headquarters from 26 October to 17 November 1999 along with the screening of about 30 films from all over the world about metal-working in Africa. A special "Iron Roads in Africa Prize" was created in 2000 as part of the 7th International African Arts and Crafts Trade Show in Ouagadougou and its first winner was a young Burkinabe, Thomas Bamogo. The Africa Iron Routes project is overseen by a 16-member scientific committee and administered by UNESCO's Department of Intercultural Dialogue and Pluralism for a Culture of Peace. The book is currently available only in French. An English edition will be published towards the end of 2002.